If you’re into the outdoors, walking, running or seeing stunning views, you HAVE to go to the coast of Italy and do the Cinque Terre. There is nothing you will regret about coming here (other than climbing a thousand and one stairs!!). The Cinque Terre is a national park and has hundreds of different trails you can take along the coast and through vineyards between five towns. Riomaggiore, Manarola, Corniglia, Vernazza and Monterosso al Mare. Thanks to Bre’s advise, I based myself in Riomaggiore (town #1), in a beautiful little hotel, Affittacamere Le Giare that I splashed out for. This post is mostly photos as I can't put into words how beautiful it is here! Riomaggiore also gave me a stunning sunset – one that I was hoping for in Santorini, but I finally got it here. It was incredible! You can do the Cinque Terre walk in a day but I did it over four days to enjoy the experience and to have time to relax in the afternoons. 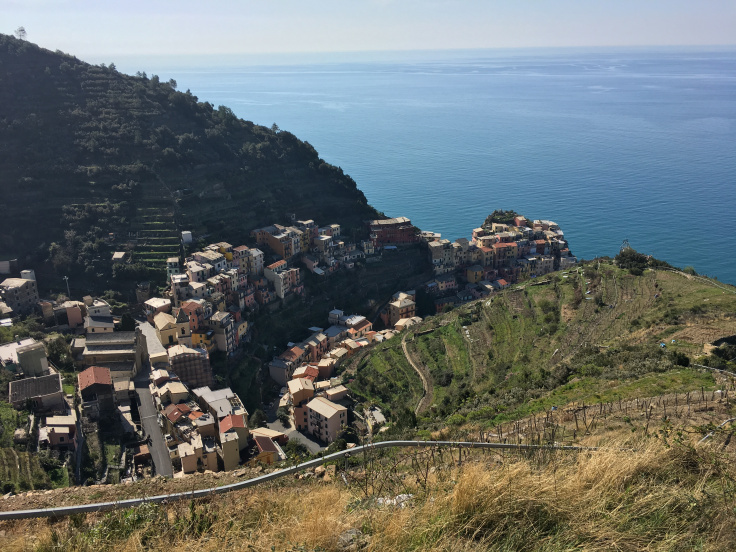 Day one, I walked from Riomaggiore to Manarola and then to Corniglia. The coastal walk between Riomaggiore and Corniglia has been closed so you need to take route 531, which I will warn you – has A LOT OF STAIRS!! But my, it is gorgeous!! As you come over the hill from Riomaggiore you overlook Manarola and see Corniglia, the next town over, you can also see Monterosso in the distance. Manarola is town #2 in the Cinque Terre and a cute little place. Each town has a marina and in Manarola you can sit down at the marina for a coffee and scone and take a little walkway to the edge of the hill for a good view. All the houses built along the Cinque Terre towns are similar, small, built on hills and painted bright beautiful colours! If we thought Wellington was hilly and hard, this will challenge that! The views are just indescribable! Leaving Manarola and heading to Corniglia you take route 506 and head to the Volastra church, once there, you switch to route 586. This was my favourite track on the Cinque Terre. In between the hideous amounts of stairs is plenty of trail that is perfect for runners and hikers. The foresty areas are perfect to give you a break from the spring sun and an opportunity to hear the birds. The descent down into Corniglia will make even those with healthy knees feel the sting as you descend down stairs, stairs and more stairs! But the breathtaking views over looking the Cinque Terre that you have just walked and the little town of Corniglia is worth all the sore feet, glutes, quads and calves you will feel for days to come! Corniglia is town #3 and a perfect place to stop for lunch, a well deserved beer and to put the feet up. Small, cute and old, Corniglia is filled with lovely Italian people going about their day giving you lovely pleasantries as you walk by. Streets cobbled and stairs decorated in flowers makes you feel like you’re in a little movie set. I picked a little café right on the edge overlooking the water with a cat watching over customers (or judging them, who knows!). I filled myself with bruschetta and a good IPA made locally in Le Spezia while staring out the amazing endless looking ocean. To finish the afternoon in Corniglia before taking the train back to Riomaggiore I walked down to the marina and wow – that view and that water!! I had beautiful blue skies everyday and in spring, it was hot come 9:30am and climbing so many stairs! No sunburn (thank goodness) just more tan and a lot of sweat, but as you can see, it was worth it; I don’t know how people walked the whole trail in jeans and sweatshirts, in ¾ leggings, I was HOT! The following days I went in shorts. This part of the walk took me about 2h 15m and was about 7.5km. I recommend taking a lot of water with you. I carried over 2L in my backpack and used most of it. The Cinque Terre ‘points’ at each train station where you can find more information and you can also do a Cinque Terre tour, but it’s a lot more fun to explore and take it at your own pace!